We can't wait to send the BRIDAL UPDATE GIFT BAG to you! It's full of samples and goodies from Eastern Shore bridal merchants... including the latest issue of the BRIDAL UPDATE. Maryland brides, just fill out the form below and we'll package it up right away for you. Congratulations on your special day! Free Gift Package available to Maryland and Delaware Brides only. 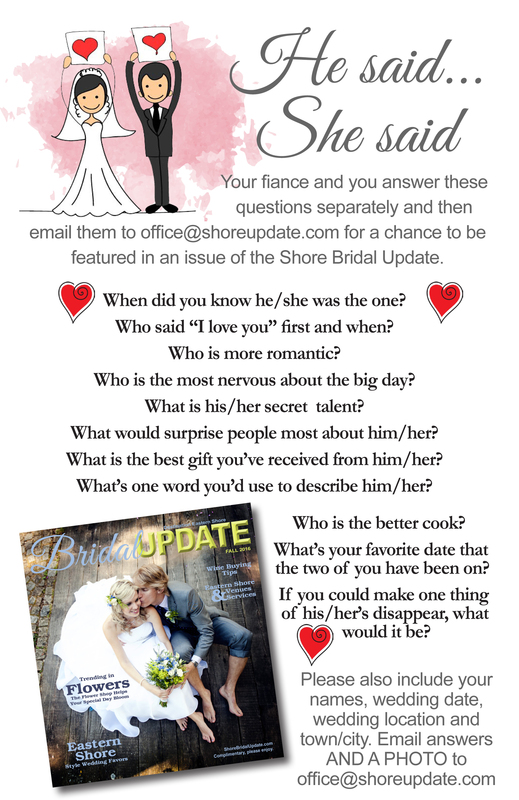 CLICK HERE to download our HE SAID, SHE SAID questionnaire for a chance to have your love story featured in the Shore Bridal Update. Gift packages are only available to Maryland and Delaware residents.